Just by looking at a star’s colour, astronomers can learn a few things about its properties. The most direct one is its temperature: red stars like Betelgeuse are cool, blue stars like Rigel are hot. Another property we can estimate by eye is the apparent magnitude, a concept idealised by the Greek Hipparchus almost 2000 years ago. He ranked stars from brightest to faintest in a scale of one to six, one denoting the twenty brightest stars he could see, and six denoting those he could barely spot with the naked eye. This scheme was adapted into a logarithmic scale by N. R. Pogson in 1856, and is still in use nowadays. The apparent magnitude depends on the star’s luminosity and distance, so if we know the latter, we can estimate the former using the measured magnitude. Knowing the luminosity and the temperature we’ve estimated from the star’s colour, we can place it in a Hertzprung-Russell (HR) diagram and infer other properties, like evolutionary stage, mass, and radius. Unfortunately, distance is a very hard thing to measure accurately in astronomy. However, there’s a way to overcome that: studying stars in clusters. In a star cluster, all stars are basically at the same distance from us, so we can ignore the effect of the distance and compare the apparent magnitude of these stars directly. We can then build a colour-magnitude diagram (CMD), the observational version of the HR diagram. Lots of our knowledge about stellar evolution came from comparing theoretical evolutionary models to this kind of diagram. With the development of high resolution imaging, CMDs revealed the presence of some unexpected stellar populations. A prominent population is blue straggler stars (BSS). These stars appear as a blue extension of the main sequence (MS) in globular clusters, right above the so-called turnoff point, where stars are about to leave the main sequence. They are unexpected because, given the cluster’s age and metallicity, stars with their properties should already have evolved off the main sequence. Blue stragglers are still there though, like they were too lazy to leave the MS. How they are formed and where they go when they finally evolve are two questions still up for debate (bite1, bite2). The authors of today’s paper studied the blue stragglers in the cluster 47 Tucanae with the aim of shedding some light on the subject. The only way to explain the blue stragglers being brighter and bluer than the turnoff is if they went through some rejuvenating process. There are different ways to do that, but two main conditions must be followed: i) one MS star must be involved, and ii) one of the stars involved gained mass to become rejuvenated. This mass gain gives the star more fuel, extending its main sequence lifetime. There are two possible ways for this to occur: mass transfer or merger. The authors considered three different scenarios: i) direct collision of stars, ii) evolution of primordial binaries, and iii) hierarchical evolution of triple systems. The resulting blue straggler can have different characteristics depending on the mechanism that caused it. The populations we observe are a combination of all these mechanisms, but one of them can prevail over the others depending on the environment. In order to try to identify the origins and possible evolution of the blue stragglers in 47 Tucanae, the authors first separated the stars into different stellar populations. 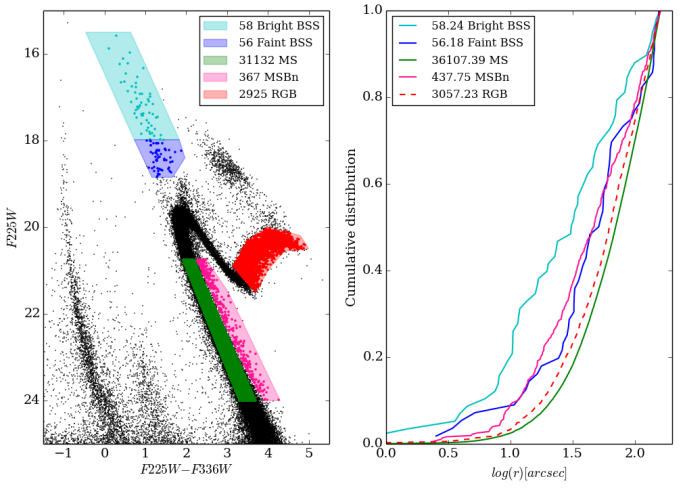 First, based on the stars’ location on the CMD, the cluster was split into two blue straggler populations, bright (bBSS) and faint (fBSS), each containing half of the blue straggler sample, main sequence (MS), binary main sequence (MSBn), and red giant branch (RGB). This is illustrated in Fig. 1. The authors then estimated the cumulative distribution of each of these populations along the radius of the cluster, also shown in Fig. 1. The first thing to notice is that the bBSS and the fBSS samples are actually different: the bBSS is more concentrated in the inner regions than the fBSS is. Moreover, the bBSS cumulative radial distribution does not resemble any of the other populations, making it difficult to link its formation to any specific group. The fBSS, on the other hand, show a distribution very similar to the MSBn, pointing to a binary origin for the fBSS. The estimated masses of these two populations are also similar, with the fBSS being slightly smaller, as would be expected for a final product of binary evolution. The mass of the bBSS is in contrast higher, suggesting an origin involving triple or multiple stellar systems. Figure 1: The left panel shows a CMD using Hubble’s filters F255W and F336W. The stellar populations identified are indicated. On the right panel, the cumulative distribution for each population is shown. The numbers of stars in each panel are slightly different because a completeness correction was done on the right panel, taking into account stars that aren’t detected because of limitations in the method. Next the authors relied on evolutionary models calculated with the code MESA (Modules for Experiments in Stellar Astrophysics) to identify the region occupied by evolved blue straggler stars (see Fig. 2). Calculating the cumulative radial distribution, they noted that what they call evolved blue stragglers (eBSS) follow a similar distribution to the blue stragglers, suggesting they are indeed linked. 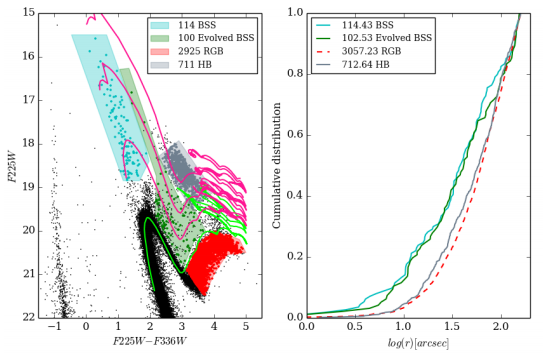 Moreover, they found an excess of stars in the RGB and the horizontal branch (HB) when compared to the expected number considering only single evolution. According to their estimates, this excess can be explained by stars evolving from blue stragglers into these regions. So it appears that the blue stragglers have a post-MS evolution comparable to that of a normal star of the same mass. There’s still some disagreement between the lifetimes the authors estimated and others found in the literature, indicating a more detailed study of individual blue straggler properties is in order to better constrain these values. Future studies using high quality spectra may help with that. Figure 2: The left panel shows again the cluster’s CMD, now with some MESA models overplotted. The sequences have initial masses of f 0.9, 1.1, 1.4, and 1.8 solar masses, from bottom to top. The right panel shows the cumulative distribution for the samples selected on the right panel. There’s again a completeness correction that makes the number of stars slightly different in the plots. In short, the authors verified that different mechanisms leading to blue stragglers can in fact be identified within a cluster. Interactions in multiple systems seem to dominate in the central regions, while binary evolution seems to be the dominant mechanism in the cluster outskirts. The former leads to more massive, brighter objects, while fainter blue stragglers are explained by the latter. The evolution of the blue stragglers seems to be similar to simple MS stars with same mass, which makes it easier to model their evolution. However, this still has some discrepancies with other results, so more detailed studies, focused on individual objects, are needed. The blue stragglers have not shown all their true colours yet. I am a second year PhD student at Universidade Federal do Rio Grande do Sul, in Brazil. I study white dwarf stars and (try to) use what we learn about them to understand more about the structure and evolution of our Galaxy. When I am not sciencing, I like to binge-watch sci-fi and fantasy series, eat pizza, and drink beer. Pingback: what color is a blue straggler in 47 Tucanae?